BY GERRY SHIH for Reuters: In a cavernous showroom on the outskirts of this port city in northeastern China, softly whirring lathes and svelte robot arms represent Dalian Machine Tools Group's (DMTG) vision of an automated future for Chinese manufacturing. On closer inspection, however, most of the machines' control panels bear the logos of Japan's FANUC Corp or the German conglomerate Siemens. 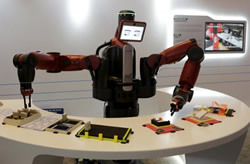 The imported control systems in DMTG's products – used in the assembly of everything from smartphones to cement trucks – are symbolic of the technology gap between Chinese and foreign industrial automation firms, just one of several challenges facing China's ambition to nurture a national robotics industry. Chinese robotics firms are also grappling with a weakening economy and slumping automotive sector, and industry insiders already predict a market bubble just three years after the central government issued policies to spur robotics development. "Last year everybody thought they could produce a robot," said Alan Lee, director of Asia sales and business development at Boston-based Rethink Robotics. "When you have market saturation you'll have filtering and M&A. These guys will be the first layer to suffer." Automatically change end effector tooling quickly and easily with Destaco's Automatic Tool Changers. Designed with exceptional repeatability, high rigidity and load capacity, they are perfect for multiple tooling applications utilizing one robot. We offer different models and sizes to handle light-duty to heavy-duty applications. Our RQC/RTP Series provides a high level of flexibility with a configurable, modular design that accommodates up to four optional modular interfaces.